While Washington state ballots will continue to be processed for several days, one measure that passed early on was Initiative 502 – the initiative to legalize and regulate marijuana. The measure allows people age 21 and older to possess up to one ounce of marijuana, and sets up a licensing system for cultivation and sale. In addition to licensing fees, marijuana sales will be taxed, which will bring in revenue for state and local governments. So what does this mean for Washington in a fiscal sense? In part, the language of the initiative provides an outline for how new tax revenue from the sale and licensing of marijuana should be spent. An analysis by the Office of Fiscal Management indicates these revenues could be as much as $500 million annually. Of this new revenue, which will be distributed between state and local governments, the biggest boost will go to healthcare, with nearly half of new revenues dedicated to the state Basic Health Trust. The Basic Health Trust funds the state’s Basic Health Plan (BHP), which provides subsidized health coverage to low-income workers. For more than two decades, the BHP has ensured accessible and affordable health care for Washington workers who do not receive coverage through their employer. Low-income workers are most likely to be uninsured, as low-wage employers are less likely to provide coverage. 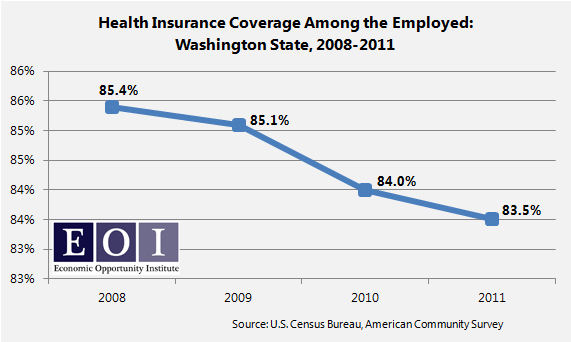 Between 2008 and 2011, Washington’s employed population lost health insurance coverage, including both private and public plans. As implementation of the Affordable Care Act gains speed, the BHP is slated to end December 31, 2013. Yet, many workers currently covered by the BHP will not be able to afford coverage under the Affordable Care Act, even with federal subsidies. However, Washington state has the option to continue coverage for this population through the Federal Basic Health Option, keeping health care affordable for low income workers. While the Federal Basic Health Option would be primarily funded with federal dollars, revenue from I-502 would provide additional support. Although there are many unanswered questions, once fully implemented, I-502 will enable a significant source of funding to ensure low-income workers have an affordable option.